Who doesn’t like bacon? This recipe became a “must make” once I found it, mostly due to the fact that there was bacon. And it was good. Not only the bacon but the biscuits themselves. You can read it here. Although the bacon syrup mixture got a little darker than I had thought it would (or hoped) these turned out to be really good. As I’ve said before, it’s not that I expected it to be bad but it was a lot better than I had thought it might be. And that is due to the biscuits. They were pretty darn good and it really is just a basic recipe. I didn’t make any changes to the recipe. I didn’t have any bakewell cream so I followed their instructions for substituting. I used a pastry blender for the dry ingredients with the butter and then a wooden spoon for mixing in the milk. To make the biscuits I did use a tablespoon and dropped heaping tablespoons all over. In the end it was probably about 16 (four by four) in the 8″ square dish. Speaking of the dish, I did use an 8″ square that was pretty deep. It recommended a deep dish to prevent anything from running over. It didn’t seem like it would run over but after pulling it out of the oven, it was bubbling a lot. Overall, this was good. I would recommend eating it warm as the syrup mixture tended to harden. 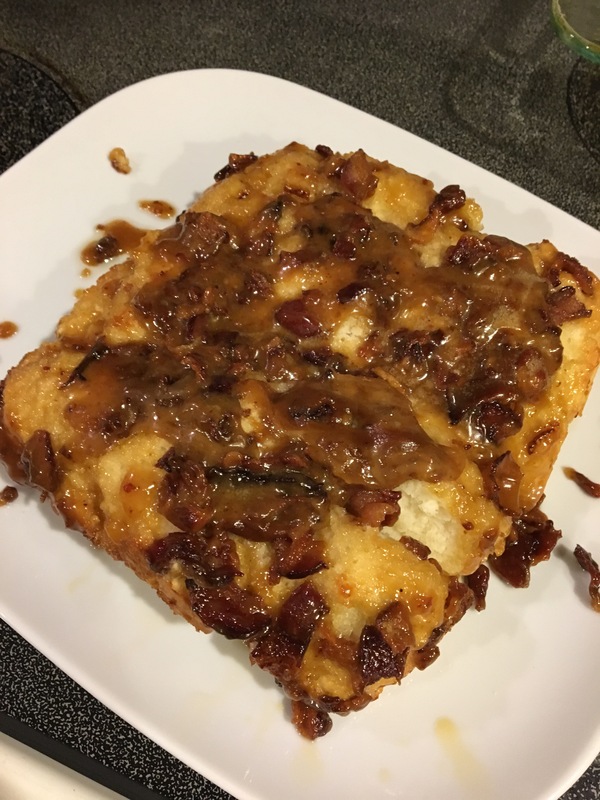 This entry was posted in Bacon, Breakfast and tagged bacon, baking, biscuit, breakfast, king arthur flour, maple. Bookmark the permalink.